HiR Information Report: Happy Morris Worm Day! Twenty years ago to the day, Robert Morris, a Cornell student at the time, unleashed his worm (from the MIT campus!) on what little of the Internet existed in 1988. 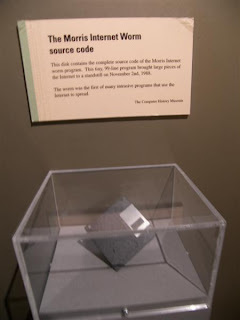 To this day, no one really knows for sure how many computers were affected by the Morris Worm, which exploited any of several different vulnerabilities in order to replicate itself. Supposedly designed to be "harmless", it caused a large-scale denial-of-service attack, partly because of an error in the routine to check if it had already infected a given host. Robert was the first person tried under the 1986 Computer Fraud & Abuse Act, and DARPA formed CERT Coordination Center in response to this incident. I found some interesting commentary about this via the Security Bloggers Network (of which HiR Information Report is a member). There's also some more information on the Wikipedia page: [Morris worm].